National Precast Concrete Association (NPCA) suppliers and producers know precast concrete provides the ultimate strength and resiliency. Adding XR QuikLiner to your precast tank provides the strength of precast concrete and the chemical and corrosion resistance of plastic. Why do some specifiers prefer plastic? The plastic industry has done a great job and spent a lot of money marketing its products—such a good job that precast is not allowed in some areas. In most cases, plastic tanks are priced higher than an equivalent-sized precast tank. Additionally, XR QuikLiner can give your holding tank equal or better liquid and gas corrosion resistance compared to plastic tanks. Our precast concrete tank liners come to you prefabricated and ensure that your system provides long-term reliability. 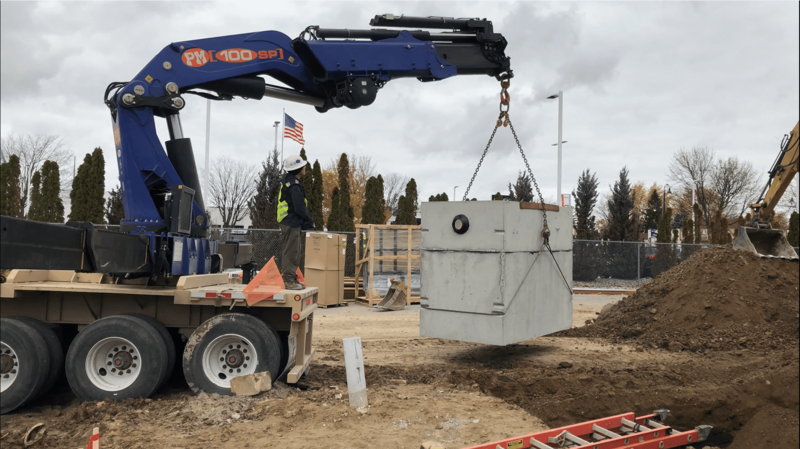 Offer your customers the best of both worlds, strength, and resilience of precast concrete and the chemical and corrosion resistance of XR QuikLiner for less than the cost of a plastic tank by contacting us today to learn more. Our team can discuss your market, provide material samples, or provide budget pricing for liners to fit your specific formwork.